Crichton’s offering is what it is: a middlebrow piece of airport literature that is two inches thick in its hardcover edition; a pulp action novel with enough dissenting material for deeply centrist, white-collar readers to imagine themselves to be principled thinkers. Global warming and environmentalism as a whole is such a fringe issue relative to physical security and economic prosperity that Crichton was able to use it as part of building his career in speaking truth to power – truths within the confines of issues that voters were then, as now, powerless to influence. American voters, despite turning out in droves to put a populist and seemingly insurrectionary Drumpf into the White House, cannot even get an artistically-designed steel-slat border fence with Mexico, let alone influence the finer policy points of the Environmental Protection Agency and its quangocracy. We are talking about a situation that is profoundly immoral. It is disgusting, if truth be told. The politico-legal-media complex callously ignores the plight of the most desperate human beings on our planet in order to keep fat politicians in office, rich news anchors on the air, and conniving lawyers in Mercedes-Benz convertibles. Oh, and university professors in Volvos. Let’s not forget them. Of course, the idea of an establishment being corrupt is not a new one (self-serving politicians? Whowuddathunkit?). But the addition of university professors to the list of targets, and Crichton’s cynicism and deconstruction of their cause in this instance, aligns him with the Right. The symbolic issue of global warming is a psychological battlefield – one of many – on which the Left/Right divide is staged: the Left serving a self-interested goal by virtue-signaling through a seemingly altruistic process, contrasting the Right’s urging for restraint and pragmatism guided by unsentimental assessments of evidence and results. Of course, those who are profiting from spurious charity (or who have an ethnic self-interest in such apparently humanitarian acts) will never give up their kvetching. The battle is for public sympathy, and by extension, political legitimacy. 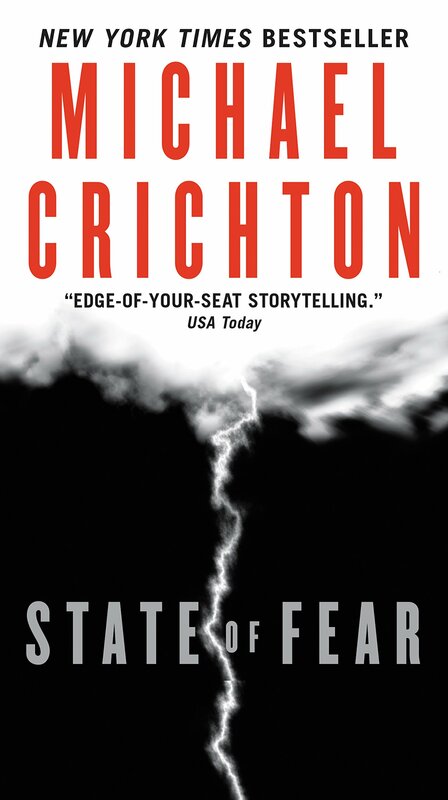 Crichton’s empty shell of a lawyer gradually hardens up in his confrontations with eco-terrorists, and is eventually brought round to the side of the “phony Right-wing fronts,” and leads the reader on a journey of self-discovery and questioning of assumptions, if he is able to keep an open mind. He discovers that maybe, the globe will not suffer a catastrophic heat death if he does not buy the latest Prius. He is put on the back foot with temperature chart after chart, all showing a decline that the powers-that-be have conspired to hide from him. He is offered alternative and sober-minded explanations for a mild and wholly predictable temperature increase around urban centers. Eventually, he may be independently-minded enough (having had this single issue brought into serious question) to understand the implications of 10 rivers doing 90 plastic, and of 13 black doing fiddy crime..
That’s where the positives of Crichton’s adventure ends. The plot is paper-thin and predictable (if you can’t predict a faked death when the sole evidence for the character’s death is a shoe, you should not even read detective thrillers). The central characters are unconvincing at best, and downright annoying at worst. There is Agent Kenner, who is either insufferable or a hard-nosed realist, depending on your chosen climate camp. Peter Evans, the lawyer drawn into the conspiracy, has not a single thought to call his own. A blonde of perfect athletic ability is given far too much dialogue, and all of it is straight from the Hollywood school of perfectly capable women. Another female climate-comrade implausibly charges guards armed with assault rifles with only a pistol, and slices up teenage cannibals. It’s all a bit farcical and tiresome, and Nepalese companion Sanjong is a whiz with a laptop and long-scoped rifle, but doesn’t get to lay hands on a clicky-ba to help Kenner’s Wolf of Kabul segment. Universities today are factories of fear. They invent all the new terrors and all the new social anxieties. All the new restrictive codes. Words and you can’t say. Thoughts you can’t think.
. . . the fabulous theory of eugenics that gained so much support was actually pseudoscience. The theory postulated a crisis of the gene pool leading to a deterioration of the human race. The crisis it claimed was nonexistent. Furthermore, he claims (setting his Mesmetron to Full Hypnosis) that “the actions taken in the name of this theory were morally and criminally wrong . . . they led to the deaths of millions of people.” Wowzers, Mikey! Are you trying to slyly imply that the entire National Socialist war effort hinged not on the simple struggle for national survival, but was in fact a paranoid fantasy and a cartoonish eugenics crusade? Kenner’s (and by extension, Crichton’s) statement is a semantic mess. What is protection except a barrier that keeps one thing separate from the presence and effects of another? Of course, the implicit claim that whites have it in their nature to be jabbering, bloodthirsty cannibals is laughable. Crichton, in his hatred of observing the ethnic divisions within the endlessly-vaunted “human race,” cannot allow civilization to be what it truly is: an expression of racial nature. Instead, Crichton’s “civilization” is one that insulates its inhabitants from themselves, and allows them only superficial lives. Perhaps Crichton genuinely believed in a liberal, humane, racially-blind society. Maybe he was writing from a script given to him by his mentor, the Polish Jew Jacob Bronoski, with whom he entered a postdoctoral fellowship at the Salk Institute for Biological Studies in San Diego . It’s possible, given Crichton’s volume of output and understanding of metapolitical rivalry, that his novel is some kind of strategic concession. 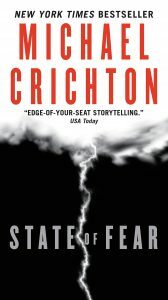 Only one thing is certain: Crichton’s tacky, propagandistic postscripts only aid the conspiracy to keep whites captive in a State of Fear. Chuck Palahniuk, Adjustment Day (London: W. W. Norton, 2018). State of Fear, p. 383. Hey, that’s the name of the show ! State of Fear, p. 459. State of Fear, p. 578.